DO try this at home before you have to do it on the trail! Each and every month, I ride the trails of eastern Pennsylvania with my club, the East Coast 4x4 Experience. Some of our members are still working on their education, while others spend the week in various technical or professional pursuits. However, one common theme that they all share is a love of the outdoors and our sport. Coming from such varied backgrounds, some of them have the mechanical know-how to rebuild their trucks from the ground up on the trail, with nothing but a stick welder and some duct-tape. Others look at their trucks as complicated pieces of machinery that they'll never truly understand. It's these four-wheelers, and others like them around the country, that much of this month's content is geared towards. There are some basic mechanical skills that every four-wheeler should possess. While it would be nice if everyone had the ability to overcome any mechanical problem on the trail, that's really an unrealistic goal, especially with new people getting into the sport every day. However, it would be nice if everyone could at least perform some regular maintenance items, like changing all their own fluids, or knowing how to remove and replace their hubs. These little things will give people a better understanding of how their vehicles work, and what might be wrong when they don't work. Also, once people realize how easy these things are to do, much of the mystery and apprehension will be taken away, and following regular maintenance schedules will take much less of a toll on the bank account. With that in mind, I've prepared quite a few articles on regular maintenance items, so that readers can see the process from start to finish and even print the articles to keep in the driveway while performing these items on their trucks. Don't worry -- for the more experienced folks, we'll still have articles on modifications and trail rides. But for those people who consider themselves "clueless", this month's for you. 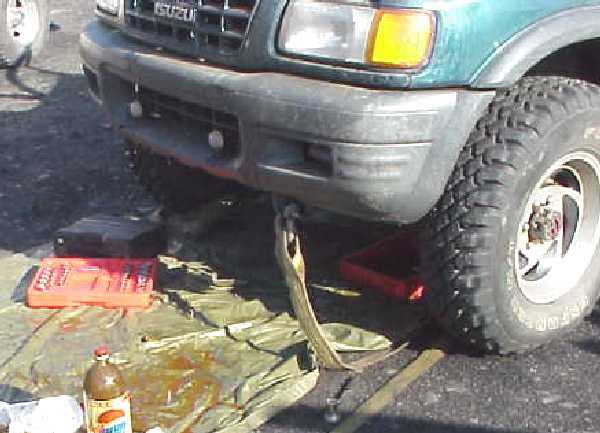 I'd urge you to take a look through the articles, print them out, and give it a try on your own vehicles -- before you end up having to do this on the trail, without the benefit of having done it at home first. I hope these articles come in handy for some of you, and please let me know if there's other maintenance items you'd like to see detailed, as we'd like to expand the maintenance section over time. Post your comments in the Isuzu Forum.